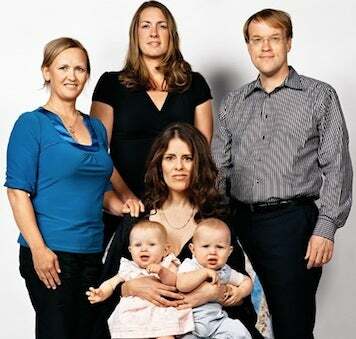 At 41, Melanie Thernstrom wanted children, but every IVF cycle failed. She turned to surrogacy, but she wanted two kids, and worried about the risks of twins. So she found two women, already mothers, to carry a third woman's eggs. The babies were eventually born five days apart. Thernstrom chronicles her experience in The New York Times magazine, and unlike the magazine's previous forays into the topic, this tale doesn't reek of unexamined privilege and entitlement. "We were able to afford it because of a financial deus ex machina," she writes. "Just when the I.V.F. bills were mounting, the software company that Michael co-founded was acquired by a large company. But there was still something disquieting about choosing to spend so much - and having an option that many infertile people did not have." There was even something I liked about the idea of a family created by many hands, like one of those community quilt projects, pietra dura, or a mosaic whose beauty arises from broken shards. If it takes a village to raise a child, why not begin with conception? When I tried to think about why I don't want to have donor-and-surrogacy amnesia, it isn't that it seems unfair to them (although it is), but that it erases our own experience of how our children came to be. At a basic level, the fact that our children originated through the good will of strangers feels like an auspicious beginning. Oddly, the very aspects of third-party reproduction that others found threatening, I found reassuring. I wanted to avoid what I think of as the claustrophobia of the nuclear family. I wanted my children to have as many other influences as possible... If you consider third-party reproduction to be simply a production detail in the creation of a conventional nuclear family - a service performed and forgotten - then acknowledging the importance of outsiders could make it all seem like a house of cards. But if you conceive of the experience as creating a kind of extended family, in which you have chosen to be related to these people through your children, it feels very rich. Families that don't qualify as "conventional" or "nuclear" have always existed, of course, even before we had the technological means to make those webs ever more complex. But it's social change, not biological, that has made it possible to openly reconsider what it means to be a family, and to celebrate those families that are already out there. For Thernstrom, that means a network of women who joyfully volunteered (with compensation) to give her two babies to raise, which, whatever you think of surrogacy, is also a form of exercising reproductive freedom. There's something even more freeing about being able to see your family as the one you choose, and the one that's built on a network of honesty and trust as well as biology.